Sew Inspired: New church bag. My first flickr blog post. Wow. I just finished up this bag, well almost. It's going to be my church tote bag, and it's a huge improvement over what I've been using. I'm hoping the handle will hold up ok. 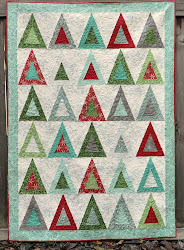 I used 2 layers of maybe a medium craft weight interfacing. 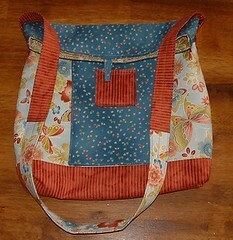 I know I've mentioned this bag here before but I'll just say again that I used Renee Plains' Foldover Bag pattern. I like it! I made the pocket patches frayed instead of, well, not, and I think it's cute that way. I don't know how to have flickr show more than one photo so if you want to see the back of the bag, click the picture to go to my flickr page. Next up: baby clothes. My sister-in-law had her baby on Monday. I have a church friend having a baby this month too. I've got some things partially cut out; I need to finish that up and rethread my machines and get busy!